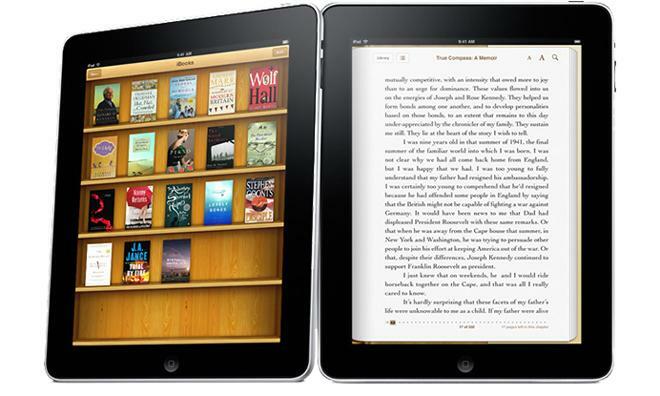 Amazon and Barnes & Noble are not currently allowed to link from their native iOS apps to outside e-book stores. But the U.S. Department of Justice has proposed a settlement that would require Apple to allow such links for a two-year period. The terms of the proposed settlement in the Apple e-book price fixing case were published on Friday by the Justice Department. Though Amazon and Barnes & Noble were singled out, the policy could apply to other e-book sellers as well. The DOJ said the change would allow consumers on the iPad and iPhone to "easily compare Apple's prices with those of its competitors." Currently, Apple takes a 30 percent cut of all in-app purchases made through App Store software, and does not allow developers to circumvent this rule by linking to a website for purchases. According to the DOJ, the changes would "reset competition to the conditions that existed before the conspiracy." A U.S. District Court judge found Apple guilty of e-book price fixing last month, but the iPad maker has vowed to appeal the decision. The proposed DOJ settlement would also require Apple to terminate its existing e-book agreements with the five major publishers it was found to have conspired with to fix prices. Those publishers are Hachette Book Group, HarperCollins Publishers, Macmillan, Penguin Group, and Simon & Schuster. In addition, Apple would be prevented from entering new e-book distribution contracts with those publishers for five years, constraining the company from competing on price. The DOJ settlement would also go beyond e-books, prohibiting Apple from entering agreements with suppliers of "music, movies, television shows or other content that are likely to increase the prices at which Apple's competitor retailers may sell that content." "The court found that Apple's illegal conduct deprived consumers of the benefits of e-book price competition and forced them to pay substantially higher prices," said Bill Baer, assistant attorney general in charge of the Department of Justice's Antitrust Division. "Under the departments proposed order, Apple's illegal conduct will cease and Apple and its senior executives will be prevented from conspiring to thwart competition in the future." The proposal, made public Friday, is pending court approval.